What is “Cleopatra’s Gold” mobile slot about? Cleopatra’s Gold from RTG Realtime Gaming is designed to be a 5-reel, 20-payline, progressive video slot which offers you a maximum jackpot of $10,000. The game includes a wild symbol, a scatter symbol, multipliers and also free spins. The maximum coins jackpot amounts to 10,000 coins and you have the limit of playing only 1 coin per line. The video slot does not provide you the option of a bonus game. The progressive jackpot in the game can get triggered randomly during the play. Cleopatra’s Gold is based on the ancient wealthy Egyptian civilization and focuses on Cleopatra’s reign. The symbols on the reels are rich in Egyptian mythology starting with the symbol of Cleopatra, scarab beetle, pyramid, eye of Horus and the cat symbol. The reels have been set in the backdrop of a desert. The game can be played on any Android device which includes the likes of a smartphone or a tablet. It is also compatible on an iPhone. Mobile phones with an HTML5 based gaming engine make the game play smooth. The video slot from RTG Realtime Gaming offers you some good ways to multiply or increase your winnings using the various symbols and the progressive jackpot. You have to choose the coin denomination by using the arrows next to the bet button before starting the game with the coin bet range varying from $0.01 to $1. You will have to enable 20 paylines by operating the arrows next to the lines button. The winning combinations can be converted or stay valid only if they appear in enabled paylines. The wild symbol in the game is the Cleopatra symbol and this symbol can be replaced in place of any other symbol to conjure a winning combination. 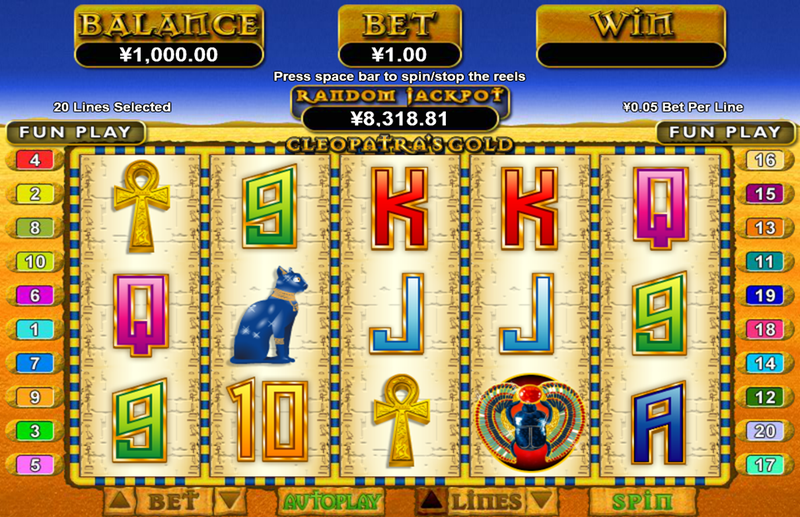 If you get 5 Cleopatra symbols in an enabled payline, then you end up winning $10,000. You have a betting range from $0.01 to $20, which offers you enough flexibility. The symbol of pyramid is the scatter symbol and getting 2 or more scatter symbols on the reel enables a scatter pay-out. If you get 5 scatter symbols then you win 500 coins. More than 3 scatter symbols trigger the free spins round and during the free spins round your winnings get tripled. The progressive jackpot that gets initiated randomly does not depend on the wagered amount or on the combinations appearing on the paylines. Just another Egyptian slot. Right? Wrong.